Of all the things I loved in Paris, the salads ranked high up there. I know it sounds ridiculous and faux-virtuous to claim you love salad — salad! — of all things in Paris. That sounds as far-fetched as saying I watch Bravo for the political commentary or love book club for the book discussions. But it’s true; the salads were all quite magnifique despite their simplicity. Mais pourquois? The answer lies in the elusive French vinaigrette. After considerable research that only a person with too much time on her hands can devote, I have concluded that there are a few key secrets to a classic French vinaigrette: shallots, real Dijon mustard made in France, and sherry vinegar. Shallots and sherry vinegar are easy enough to find, but real French Dijon is another story altogether. Before you go any further, let me say that this recipe certainly WILL work with US made Grey Poupon, and it will be respectably good. But it won’t be perfect. To say I am a bit obsessed with my acquisition of Maille mustard made in France is a bit of an understatement. Since the mustard from the tap I purchased from the Maille store in Paris is unpasteurized, I have accepted that I can only obtain that through another visit to the Paris store or I’ll need a hired mustard mule to smuggle some through customs. However, the next best thing is jarred French Dijon, which I figured should be easy enough to find. Wrong! I have searched Amazon. I have searched eBay. I have combed foodie message boards. I have emailed food bloggers. I have, in short, gone a little nutty trying to find this mustard. Of course, to a French person, this probably sounds like someone saying they have searched the world for a bottle of Heinz ketchup. I finally found a reputable online source which won’t break the bank here. I am sure there may be others, so feel free to pass on your US suppliers if you’ve got them. 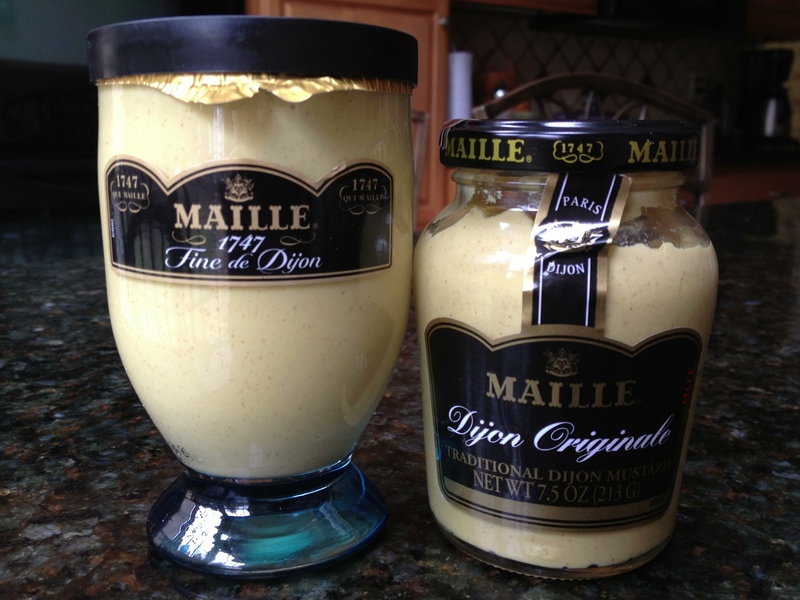 Here is a picture of two jars of Maille. The one on the left is made in France, and the one on the right is made in Canada. The French version is almost twice as strong and concentrated as the Canadian version (which we can all find easily in almost every US grocery store). They may look the same, but they are not the same. Of all the recipes I’ve tried, this simple little recipe from David Lebovitz comes the closest to replicating the many wonderful vinaigrettes I enjoyed in Paris. I hope you enjoy this as much as I do. 2. Mix in the Dijon mustard. (Note: ff you are using a US or Canadian manufactured mustard, you will need at least 1 heaping teaspoon to start, possibly a bit more. If you are using French Dijon, a mere 1/2 teaspoon will actually be enough.) Add 3 tablespoons (45 ml) of olive oil. Stir well, then taste. If too sharp, add the additional olive oil and more salt, if necessary. If using fresh herbs, mix them in shortly before serving so they retain their flavor. This dressing will keep for about eight hours at room temperature. This entry was posted in Salads and tagged Maille mustard made in France, perfect French vinaigrette, real Dijon mustard by Mom Mom's Apron. Bookmark the permalink. I can’t wait to try this. I have a simple vinaigrette recipe also that i will post. But looking forwrod to trying yours. Love the simplicity of it. Thank you! I will be on the lookout for yours as well. my apologies… i found your link! No problem — glad you found it! David Lebovitz is a great source for French recipes, and he’s never steered me wrong yet.